From the first line, “I feel like I’m on fire,” Mikel Aki’leh Jones delivers a powerful poem on beauty and blackness. Against a rhythmic score, Aki’leh enumerates the ways in which she’s been told that her black skin is “a sign of dirt” to others -and how she ultimately finds strength and confidence through her faith. Mikel Aki’lah Jones is an 18-year-old writer from Brooklyn, New York. 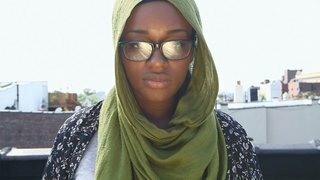 She began writing at the age of eight, using her work as a way to share her reality as a Black Muslim woman. She was published in the 2012-2014 Poet-Linc Youth Anthologies, which was created by the Lincoln Center for the Performing Arts and has shared her work at the Nuyorican Poets Café, Lincoln Center, and the Brooklyn Public Library. Mikel is currently living and studying in Lyon, France. Musa Syeed, an independent filmmaker and writer, is the Artistic Director & Lead Instructor of the Muslim Youth Voices project. His first feature film, Valley of Saints, won the 2012 Audience Award at the Sundance Film Festival. He has taught film for Williams College and the Tribeca Film Institute. Musa was a Fulbright Fellow in Egypt and is an alumnus of the Tisch School of the Arts and the Middle Eastern & Islamic Studies Department at New York University. Read the full Q&APBS spoke with Writer Mikel Jones about the judgment she has received as a black Muslim woman and how she is working to overcome those experiences.